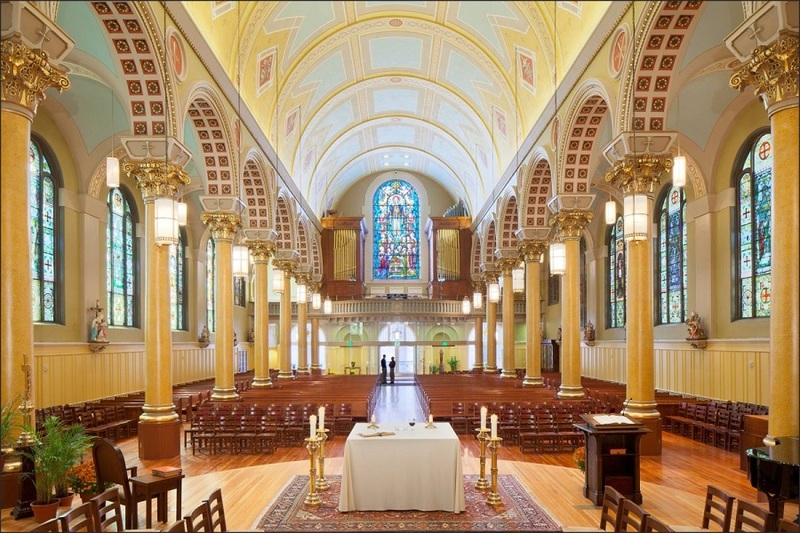 The following summarizes acoustical analyses performed by David Coate Consulting (DCC) in support of the St. Cecilias Church Renovation Project in Boston, Massachusetts. DCC analyzed several acoustical issues associated with the St. Cecilia Church Renovation Project. Simultaneous use of the Sanctuary and spaces below are planned in the new configuration, and there are concerns about the potential for unacceptably audible activity noise between the two floors. This report includes the latest sound isolation treatment scheme consisting of GWB resiliently mounted on new joists. The advantage of this treatment is that the new ceiling would not have direct contact with the existing ceiling. 1. Airborne sound isolation between the main Sanctuary and spaces below. 2. Impact sound isolation between the main Sanctuary and spaces below. 3. Sound isolation between the choir practice room and Sanctuary. The Uniform Building Code requires an STC (Sound Transmission Classification) and IIC (Impact Isolation Classification) of 50 between units in multi-unit residential buildings. This value is a reasonable starting point for this project, but should be considered as the minimum acceptable value. Please note that depending on the source level and the ambient sound level in the receiving room, STC 50 does not guarantee the inaudibility of sound from the adjacent space. It is possible to design floor/ceiling partitions with STC values higher than 50, which has merit considering the importance of the sound environment during worship services. To illustrate this point, a sound source producing 80 dBA in the space below the sanctuary would result in approximately 30 dBA in the sanctuary assuming STC 50. While 30 dBA is a relatively low level, depending on the frequency content of the source and ambient sound level in the sanctuary, it could be quite audible during quiet portions of a worship service. Airborne sound refers to the transmission of sound from one space to another when there is no physical impact on the structure causing the sound. Examples of airborne sound would include voices and music playback systems. Noise Level Reduction (NLR), the difference between noise levels in the Sanctuary and the first floor, measures how effective the partition between floors is in terms of airborne sound isolation. I measured the NLR of the ceiling/floor partition by reproducing pink noise through a high performance sound system and measuring the difference in noise levels between the two floors (in 1/3 octave bands). Pink noise sounds like rushing water, and essentially has equal sound energy in each 1/3 octave band. This type of noise is used for a NLR tests in order to have consistent frequency content which is unchanging over time. Figure 1 shows the measured Noise Level Reduction (NLR) for the ceiling/floor partition. This NLR corresponds to STC 48 which is less than the UBC STC requirement of 50. Please note that this airborne noise test was conducted approximately in the center of the Sanctuary, where the existing coffered ceiling below is still intact. At your request, I also measured the NLR of the ceiling/floor partition where the coffered ceiling has been removed. This test was conducted to determine how much effect the coffered ceiling has on sound isolation performance. Figure 2 shows the results of this test in 1/3 octave bands which corresponds to STC 32, substantially below the UBC STC 50 requirement. This data also shows that the intact portion of the coffered ceiling adds considerably to the sound isolation performance of the ceiling/floor partition. Impact sound refers to the audibility of footfall and other impacts on the Sanctuary floor in the spaces below. The Impact Isolation Classification (IIC) can be measured using a standard calibrated tapping machine. I conducted impact isolation testing in accordance with Standard Test Method for Field Measurement of Tapping Machine Impact Sound Transmission through Floor-Ceiling Assemblies and Associated Support Structures. (ASTM E 1007-04). A total of 16 1/3 octave band spectra are required, each associated with four different tapping machine positions and four microphone positions in the receiving room. In addition, the procedure calls for measurement of the RT60, the reverberation time of the receiving room (the lower floor) to normalize the results to a standardized room absorption. Figure 3 shows the results of these tests. 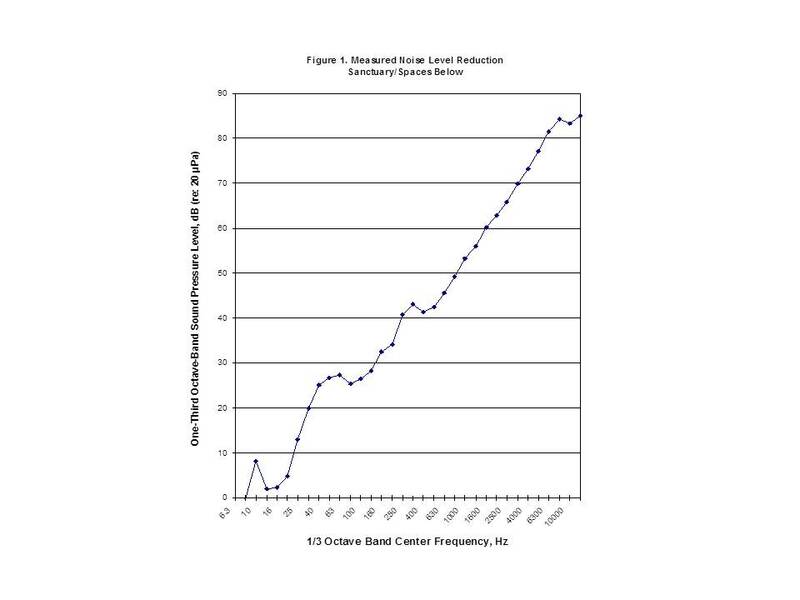 The blue curve is the normalized sound pressure level in the receiving room caused by the tapping machine on the floor above. The red contour curve is adjusted mathematically to correspond with the blue curve, to arrive at a single number IIC value. The results shown in Figure 3 correspond to IIC 38, which is substantially less than the UBC Code requirement of IIC 50 or greater. At your request, I measured the NLR between the choir practice room and the Sanctuary upstairs. Even though potential flanking paths are circuitous between these two spaces, there is some concern about the potential audibility of choir practice sound during services. I placed the loudspeaker/pink noise generator in the choir practice area and measured the noise level within this room and upstairs in the Sanctuary with all intervening doors closed. I understand that the stair well between the first and second floors will not exist in the proposed configuration, and it appears that pink noise through the stairwell may have influenced the data measured in the sanctuary to an unknown degree. However, in spite of that potential flanking path the measured NLR was quite high and therefore it is very unlikely that choir practice sound will be an issue in the sanctuary. Unlike the path between the sanctuary and spaces directly below, the path from the choir practice space to the sanctuary is much more circuitous. However, it would be prudent to insure that all doors between these two spaces are solid core, and tightly sealed with perimeter gaskets and drop down threshold gaskets. 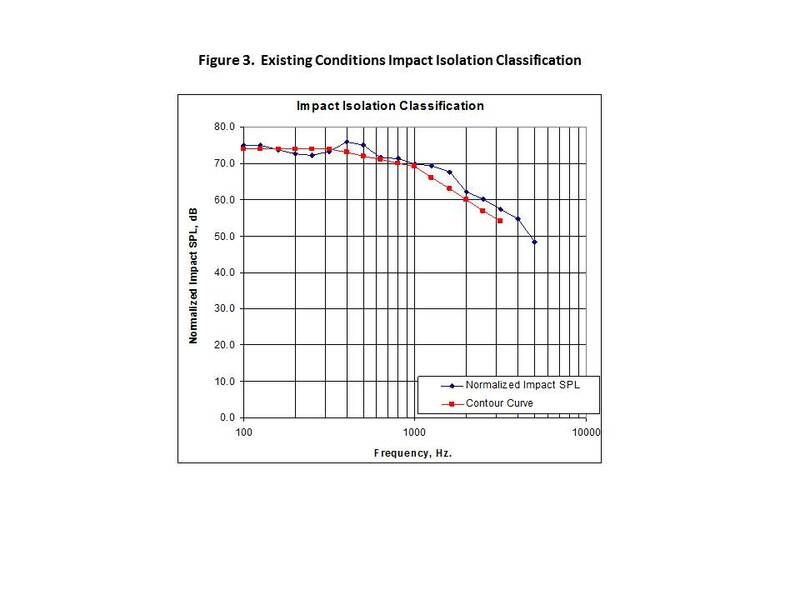 To summarize the testing results, both impact and airborne sound tests revealed relatively poor IIC performance and moderate STC performance, so in this case sound isolation performance is essentially governed by structural transmission. Requisite treatment options would decouple the floor and ceiling, thereby minimizing the transmission of impacts on the floor to the ceiling below. Decoupling and/or adding mass would also improve the STC performance. Options 1 through 5 describe different sound isolation schemes each with increasing performance. Adding blown in insulation in the cavity between the coffered ceiling and the joists would likely increase the NLR by 2 to 3 dB. While fiberglass or cellulose insulation has little mass and does not increase the transmission loss per se, its absorption characteristics usually will help reduce resonances which occur in the empty cavity, usually amounting to a few dB of improvement. This would increase the sound isolation performance to approximately STC 51. This 3 dB improvement would be just noticeable to most people. In general, such cavities should be filled up to 50% with insulation. Packing the insulation tightly in the cavity can actually degrade sound isolation performance because of increased coupling between partitions. In this case, approximately 4� of insulation should suffice. In terms of addressing impact sound, I recommend the addition of carpet runners along the aisles in the Sanctuary. Please note that the addition of thin commercial grade carpet may not improve the IIC noticeably. On another recent DCC project, tapping machine tests showed an improvement from IIC 33 to IIC 59 by adding a carpet with a thick pad. Please note that the UBC code of STC 50 is directed at multi-residential buildings and is a good starting point for sound isolation projects. However, this project is potentially different because the lack of sound intrusion from adjacent spaces can be important for worship services held in the Sanctuary. Based on a sample children�s activity noise spectrum (a single child yelling), the sound isolation performance of Option 1, and ambient sound levels measured in the Sanctuary, children�s activity noise would likely be audible at times in the Sanctuary. Adding a conventional 5/8�GWB ceiling below the coffered ceiling (and assuming blown in insulation) would increase the sound isolation performance to approximately STC 53. Ceiling penetrations (such as due to HVAC return ducts) should be boxed in with either GWB or a material of equivalent mass. The length of the boxed in portion should be 2 to 3 times the size of the opening in order to make that flanking path sufficiently circuitous. This option would be approximately 5 dB better than existing conditions which would be a substantial improvement. Occasional sound intrusion from downstairs is still possible with this option, with slightly less audibility than Option 1. Resiliently mounting the 5/8� GWB ceiling with resilient channel would increase the sound isolation performance to approximately STC 55. In this option, it is important to prevent rigid connections between the new and existing ceiling from short circuiting the resiliency of the new ceiling. A quarter inch gap should be maintained along the perimeter of the ceiling, which should be filled with non-hardening acoustical caulk. HVAC return ducts which would penetrate the new ceiling should be resiliently connected by the use of a short run of flex duct. 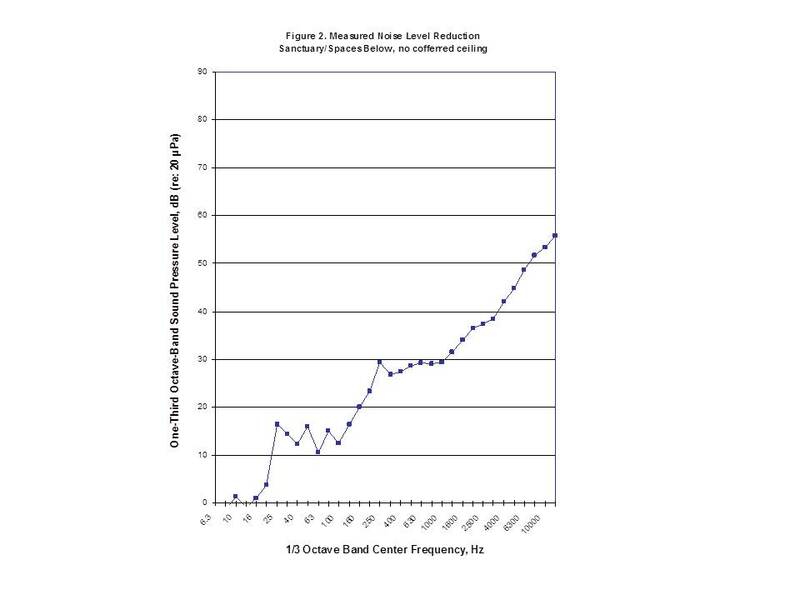 STC 55 would be approximately 7 dB better than existing conditions, and sound intrusions from downstairs could be still be audible at times, but less frequently than with Option 2. Resiliently mounting the GWB ceiling with spring hangers will likely further improve the sound isolation performance. 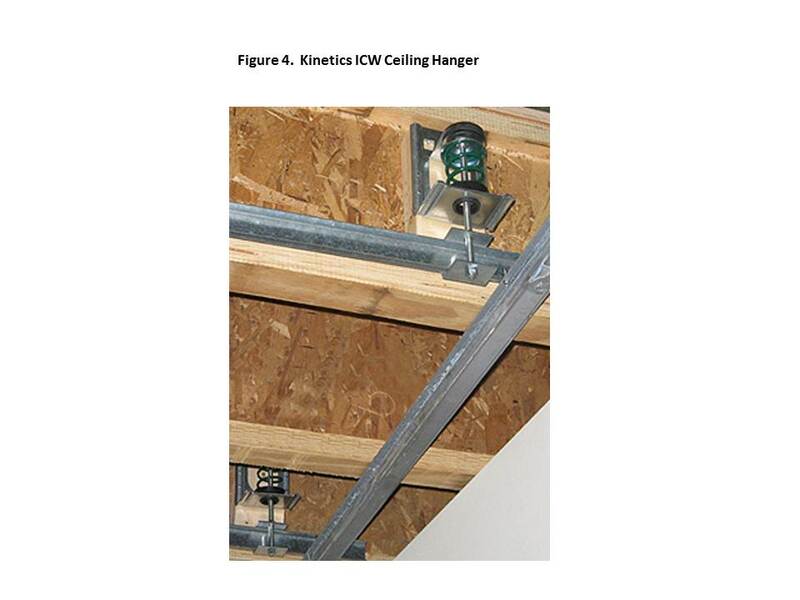 Kinetics Noise Control�s ICW ceiling hanger (shown in Figure 4) is an example of such a spring hanger. According to Kinetics test data, a configuration similar to Option 3 using the ICW hanger resulted in STC 59 and IIC 52. STC 59 is 11 dB above the STC of existing conditions which would constitute a subjective halving of loudness of sound intrusions from below. Sound levels from below would likely be at or below ambient levels in the sanctuary and therefore inaudible most of the time. As discussed, the best performance of this option will be achieved with no penetrations in or rigid connections to the GWB ceiling. This approach may only be possible in classrooms. For spaces such as fellowship hall where this approach may not be possible, boxing in duct penetrations and the use of short runs of flex duct should be employed. STC 59 is near the top end of the range of performance of wood frame construction. It is possible to design floor systems with higher ratings, but typically those systems would include a combination of concrete slab and resiliently mounted GWB. Ceiling hanger sound isolation schemes are typically used because in many cases the addition of separate ceiling joists is not possible because of the required long spans. In this case however, since a number of the planned classrooms have relatively small dimensions, separate ceiling joists are possible. This particular scheme has great advantage over the spring hanger approach because the new ceiling would not touch the existing ceiling. There would be some circuitous flanking paths up through the wall supports on which the joists are mounted. However, as long as the 5/8� GWB ceiling is resiliently mounted to the joists, those flanking paths should not be problematic. Large airspaces between the new and existing ceiling also provide additional low frequency sound isolation performance. These airspaces should be filled approximately by 50% with loose fiberglass batt. A �� gap should be left around the perimeter of the ceiling and filled with a non-hardening acoustical caulk. Three configurations were analyzed: 1) 3� airspace, with GWB resiliently mounted, with existing coffered ceiling, 2) 3� airspace, with two layers of GWB resiliently mounted, and no coffered ceiling, and 3) 1� airspace, with two layers of GWB resiliently mounted, and no coffered ceiling. 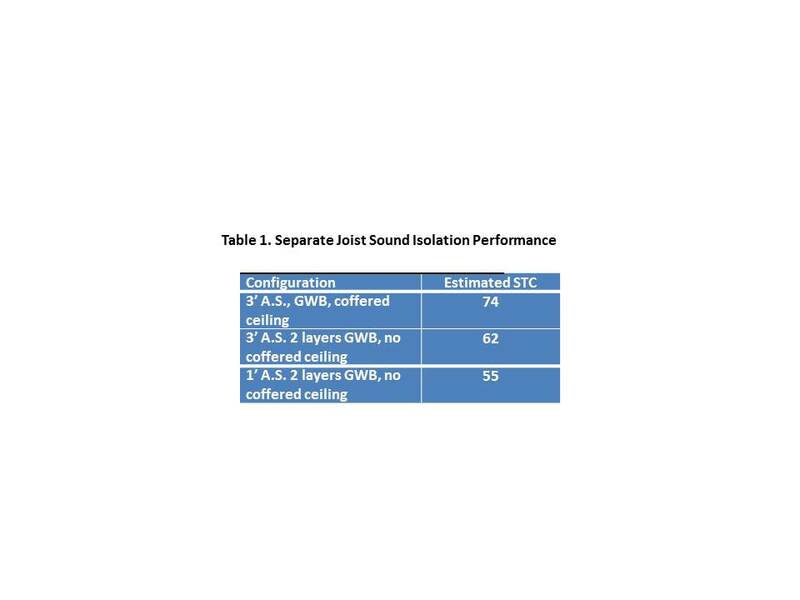 Estimated sound isolation performances for these configurations are shown in Table 1. All of these configurations would result in child activity noise levels lower than measured ambient noise levels in the sanctuary. Acoustical ceiling tiles (ACT) previously planned for classrooms and other spaces on the bottom floor will need to be replaced with different acoustical treatments because of the new separate joist ceiling construction concept. The required sound absorption (measured in sabins) to be provided by a different treatment can be calculated on the basis of area and the Noise Reduction Coefficient (NRC) of the material. I recommend that the ACT be replaced with 2� thick Owens Corning 703 semi rigid acoustical panels covered with fire rated and acoustically transparent fabric. Guilford of Maine manufactures this type of fabric. Assuming �� ACT with an NRC of 0.8, and Owens Corning 703 at NRC 0.93, a smaller area of absorption treatment would suffice. The required smaller area of coverage can be calculated by multiplying the ACT area by 0.86.